"Please convey our thanks to all involved in our project at our church. There have been numerous positive comments about your work and the improvement in accessibility." "I've been meaning to email you to let you how much I love my new stairs and to tell you how impressed we were with the guys who came out to install the stairs and put in the railing, they did a fantastic job thanks for your help in all of this." "Thank-you so much for installing my new stairs and floor. They are truly the most outstanding renovation I have ever done." "My husband Jim and I just cannot get over the improvement and beauty of it all! Todd was wonderful ! He is thorough, meticulous and hard working, as are any of the other men at Roes Stairs that had a hand in making this work of art"
"If you could thank Scott for the great workmanship, it would be greatly appreciated"
"Just wanted to thank you again, You did a great job with the design and the installer Todd did a great job on his end." "Thank you for delivering and installing the caps! The stairs are beautiful. Your guidance and care remain invaluable and appreciated." Our representatives are committed to provide our clients throughout all of Southwestern Ontario and beyond the opportunity to design and build a functional, yet beautiful compliment to your home. 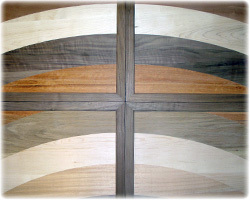 Stair railings and custom stair design is about turning specially selected woods into our exceptional product. This has been a Roes Stair tradition for over 45 years. Constant innovation in staircase design has further enhanced our reputation as the acknowledged leader in our market, which services London Ontario, as well as Oakville, Burlington and Mississauga. Stair railings construction begins with your concepts so that each project becomes a unique staircase. A keen awareness of stair design options allows us to ensure an optimum balance between space and comfort. A stair must not only look good, it must also feel good. Close contact with you and our stair building team ensures that our high standards and your ideals are not compromised. Working with only the finest materials and stair plans, our craftsmen take pride in creating projects of lasting value. Attention to detail does not end with the construction of the stair and railings components. Our stair railing installation team ensures that each stair design meets the standard of excellence that has become our signature. A demand for quality and commitment to integrity, passed down by my grandfather and father, continue to be an integral part of my commitment to building only the finest stairs and railings. For over 4 decades Roes Stair has provided the highest quality staircases and stair railings in London Ontario. For two decades we have also manufactured some of the highest quality stair railings in the Toronto area, including Mississauga, Oakville and Burlington.